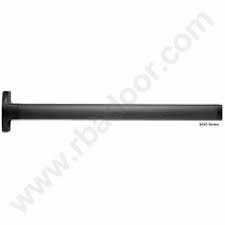 Falcon/Dor-o-matic 1790 Series, DC13 Dark Bronze Finish Rim Exit Device, 36"
Product prices and availability are accurate as of 2019-04-22 15:59:36 UTC and are subject to change. Any price and availability information displayed on http://www.amazon.com/ at the time of purchase will apply to the purchase of this product. Low maintenance and high reliability. The 1790 rim device is typically used in applications where maintenance is a concern because the rim device has fewer parts and pieces than current exit devices. The result is less maintenance and adjustment. The streamlined design has no openings for chains, reducing the risk for code infringements and offering increased building security by eliminating the possibility of tampering and forced entry through the use of coat hangers and other tools. The 1790 may also be used to retrofit a 2090 series crossbar device.